There are more than 2 million "private security" officers and guards on the streets of America and this number is growing by the day in Oakland and other cities. The United States is in the midst of the most radical privatization agenda in its history. We see this in schools, health care, prisons, and certainly with the US military/national security/intelligence apparatus. There are almost 200,000 "private contractors" in Iraq (more than US soldiers) and Obama is continuing to use mercenaries there and in Afghanistan and Israel/Palestine. At present, 70 percent of the US intelligence budget is going to private companies. This privatization trend is hardly new, but it is accelerating. While events such as the Nisour Square massacre committed in September 2007 by Blackwater operatives in Baghdad show the lethal danger of unleashing mercenary forces on foreign soil, one area with the potential for extreme abuses resulting from this privatization is in domestic law enforcement in the US. Many people may not be aware of this, but since the 1980s, private security guards have outnumbered police officers. "The more than 1 million contract security officers, and an equal number of guards estimated to work directly for U.S. corporations, dwarf the nearly 700,000 sworn law enforcement officers in the United States,"according to The Washington Post. Some estimate that private security actually operate inside the US at a 5-to-1 ratio with police. 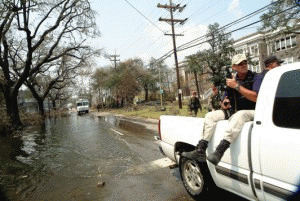 In New Orleans in the aftermath of Hurricane Katrina and the flooding of the city, private security poured in. Armed operatives from companies like Blackwater, Wackenhut, Intercon and DynCorp spread out in the city. Within two weeks of the hurricane, the number of private security companies registered in Louisiana jumped from 185 to 235. In New Orleans at the time, I interviewed Israeli commandos from a company called Instinctive Shooting International as they operated an armed checkpoint on Charles Street after having been hired by a wealthy businessman. I also interviewed private guards who bragged of shooting "black gangbangers." The abuses by private security guards in New Orleans and elsewhere has not to this day been thoroughly investigated. Moreover, the legality and constitutionality of the deployment of these modern day Pinkertons needs to be seriously explained to the US public. Now it seems that some cities think it is a great idea to expand the use of these private forces using tax-payer funds. The Wall Street Journal this week reported, "Facing pressure to crack down on crime amid a record budget deficit, Oakland is joining other U.S. cities that are turning over more law-enforcement duties to private armed guards. The City Council recently voted to hire International Services Inc., a private security agency, to patrol crime-plagued districts. While a few Oakland retail districts previously have pooled cash to pay for unarmed security services, using public funds to pay for private armed guards would mark a first for the city."